So I've started to work more seriously on my "nature mage" class (still looking for a better name than that!). I've decided that the class will indeed be going in my book of magic (also in need of a name! ), so I have a lot of new spells to write for it. It has a foundation of spells shared with the AEC druid, and some shared with the standard magic-user (clone, for instance), but largely it's a completely new spell list, which is a pretty fun project! Here are a couple of spells I came up with last night for the nature mage. They're both quite weird and witchy, and not the kind of spells that you'd end up using in a dungeon :) But they give a bit of a feeling for the flavour I'm going for with this class. This spell provides a strange arcane means of bypassing the norms of sexual reproduction. The caster must first select the female who is to be impregnated and the male who is to be the sire. The pair must be of the same species, or of close enough species that they could normally reproduce. Neither of the pair need be willing participants in this spell, and no saving throw is allowed. The spell must be cast twice – firstly on the male, and again (within one week) on the female. In both cases the spell takes the form of an hour-long ritual, during which the target must be within touch range of the caster. The ritual requires the use of rare herbs and ointments costing 500gp per casting. This sinister spell effects the transference of an unborn child from its mother to the womb of another female. Females of any species can be affected, and both the original and the receiving mother must be present as the wizard casts the spell. The casting requires an hour-long ritual, and the expenditure of 500gp of rare oils and incense. Embarking on a self-publishing venture! For some time I've been thinking about the possibility of making a book compiling all the new spells and magic-using classes I've been coming up with. So the other day I cut and pasted it all together into a single document, just out of interest to see how much content I have already. And, to my surprise, it came to almost 40 pages! This has galvanised me to complete the project. The elementalist class (available here). Possibly expanded with some additional spells. 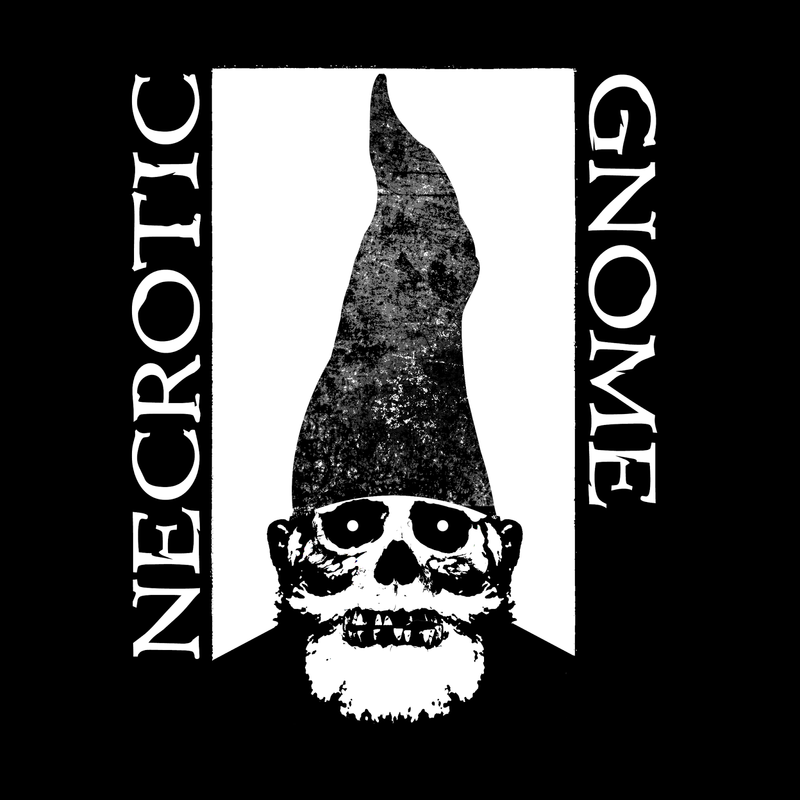 The necromancer class (which I've been working on for a while "behind the scenes", and which already has about 50 new spells). The fey class (available here). Also possibly expanded with some additional spells. The expansion of the illusionist class which I've been working on. Edit: Just maybe the hypothesised nature mage, if I feel really inspired. I think it'd be a very cool class, but I'd only include it if I thought I'd be able to do it justice. A selection of magical tomes (each containing a bunch of new spells around a specific theme -- including, for example, the tome of the spider mage). Any other random bits & pieces relating to arcane magic which I feel like throwing in! Everything will be specifically compatible with Labyrinth Lord, but of course that means it's equally usable with Swords & Wizardry, B/X D&D, AD&D, etc. Primarily I'm doing this for my own pleasure. I think it'd be totally cool to have an actual properly printed book of my own classes and spells to use in my games! But of course, once I've gone to the effort of writing, compiling and laying everything out, and then publishing it on Lulu, then it'll certainly be available to other people as well. I don't have a name for the book yet, and no idea what to do about artwork! As it's purely a hobbyist thing, I don't really imagine investing any money in this venture (i.e. to pay artists), but it would of course be nice to have at least a good-looking cover (I'm imagining old-school style black & white illustration to go along with the LL books). If any artists reading this are up for drawing some stuff, please let me know -- I could probably offer you a print copy of the book if all goes well! Any thoughts or suggestions most welcome! All in all it was a very interesting and positive experience, and I'd definitely do it again. I thought I'd write a bit about a few of the points which stood out the most. After some indecision, in the end I made the choice for fully random character creation (rather than getting the players to choose from a selection of pregens). Random chargen is such a big and (I find) fun feature of old-school D&D that it seemed a shame to not showcase it. To ease the process I'd created a few spell books for potential magic-users to choose from (see here), a very simplified list of cleric spells, and a quick-pick equipment selection. I usually find that as a DM I can knock out Labyrinth Lord characters in 15 minutes or so, whereas generally players tend to take significantly longer, due to, I suppose, being a bit less familiar with the system, and probably thinking more about the various choices. So I was very relieved that yesterday it all went very smoothly, and, thankfully, quickly. The one point which threw me slightly was what to do if a player rolled up a character with really crap ability scores. This did happen (I think he didn't have anything above 10), and in the end I said he could have a 13 in a score of his choice, just to give him a +1 to something. I think perhaps it might have been better to just let him roll completely again, or maybe to get each player to roll two sets of attributes and choose their favourite. A minor point, anyway. I made sure each of the PCs had a specific connection to one of the others, by getting them to roll on a random table ("you owe another PC lots of money", "you're a sibling or parent of another PC", etc). This was a tip which Samwise7 gave me in a comment to a previous post, and it was excellent advice. In practice only one out of the three randomly generated connections actually had any impact on the game (that the thief character was a hired bodyguard of the magic-user), but it really helped to give the players something to riff off, so to speak, right from the beginning. This was one of the main things I was anxious about beforehand. I'm used to playing with a regular group, where we all get to know each other's tastes, personalities, sense of humour, and so on. I had fearful visions of sitting at a table with six strangers looking at me in a kind of stony silence, only broken by the occasional pitiful die roll. Haha. Of course, nothing of the sort happened. A friend and player in my regular game came along to the con and gave me moral support, which helped a lot (I'd definitely recommend that new con DMs try to drag a friend along! ), and the other players were really friendly and enthusiastic, which was a huge relief. I mean, it's obvious to me now that, looking at it realistically, people go to a gaming con to play games and have a good time, so the vast majority of them are, I suppose, going to put something into the game they've signed up for! This was a very good experience for me, anyway, to be able to run a game with strangers (albeit a small group), and feel confident that they were having a good time. That brings me nicely to the next point -- the tone of the adventure. I tend to favour weird and wacky, bordering on the surreal and nonsensical at times. Much as I love this type of play, I am certainly aware that it's not everyone's cup of tea, and it's not necessarily what people are going to expect when they sign up for a game at a con. So, as I was writing my far-out sci-fi / fantasy dungeon crawl I was, at points, aware that some elements of it may be too much. The malfunctioning dimensional toilet and the sewage-elemental, for example. I personally found these kind of elements so beguiling that I just couldn't make myself remove them or tone them down, and just decided to go with it and see how the players took it! In retrospect I think it was too much. If I'd clearly stated in the description that the game was going to have a far-out gonzo kind of vibe to it, then fair enough, but I didn't, and I think the players who didn't already know me were a bit taken aback at points. However in general the session went well, and the more nonsensical elements weren't on the whole too overwhelming. This is another point which I'd seriously reconsider next time. The game I ran was a straight up dungeon crawl -- here's a dungeon, there's rumoured to be treasure inside, in you go. Again, I'm not sure if it was due to player expectations (though I did state in the session description "an old-school dungeon crawl"...), but I got the feeling that something a little bit more plot-based might have worked better, and kept them more engaged. 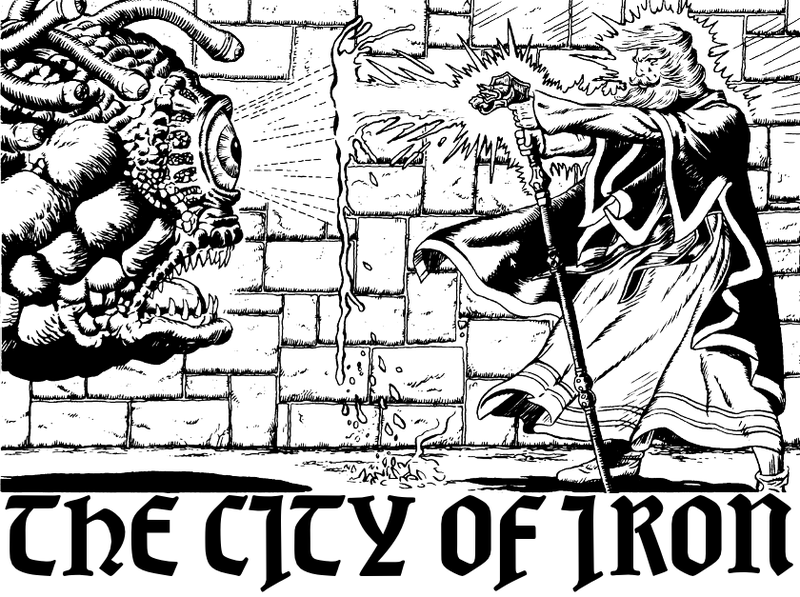 It's interesting, when I think of the big AD&D cons back in the day, I always imagine they were playing straight up dungeon crawls, so I guess that was where my inspiration came from. I have no idea if this is really how it was though. Time ran out and we didn't finish the adventure. This is, of course, far from ideal! There were several possible endings (apart from a TPK), and unfortunately we didn't reach any of them. I guess there are a couple of factors here, one being the mission of the adventure, as discussed previously, and how easy it is to reach a conclusion, and of course another being just the actual real time restraint on the session as compared with the length of the adventure. 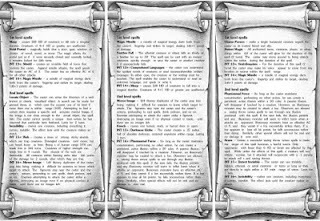 I was just thinking about my idea some time ago of expanding the illusionist spell list to include 8th and 9th level spells, and remembered that I actually had quite a few lying around which I'd meant to post here but forgot about. So here they are: firstly there's a low-level variant of invisibility, which will probably be quite useful, followed by several high-level spells, some of which are Labyrinth Lord re-workings of classics. This spell functions in the same manner as the 2nd level spell invisibility, except that the subject is only invisible when immobile. The subject becomes visible whenever he moves, and invisible when keeping still. The spell's duration, as with the standard invisibility spell, only ends when the subject makes an attack. When this spell is cast in a location where a specific event is known to have occurred, the caster and up to one companion per two levels are drawn into a vision of the past, re-experiencing the event in question. The event which is the focus of the spell must be known to the caster, and can have occurred up to 100 years ago per caster level. In the vision the caster and his companions take on the perspectives of individuals who were present at the historic event, perceiving what happened directly from the point of view of those involved. If an insufficient number of sentient beings were present at the event, additional companions of the caster will perceive a vague retelling of the event as if seen from above. The duration of the vision is seldom more than an hour, with longer events being reviewed in a kind of "highlights" form. While immersed in the vision the caster and his companions are in a trance state. If any of them are harmed the vision is broken immediately. Casting this spell optionally ages the caster 3 years. It is rumoured that an enhanced version of this spell once existed, allowing not merely the viewing of the past, but also the power to alter the flow of history. This spell allows an illusionist to create an intensely focussed beam of strobing light energy which can have one of three effects (chosen as the spell is cast). Firstly, the beam can be used to cause 1d6 points of heat damage per caster level to a single target in range. Secondly, the beam may be used to disrupt matter, functioning in the same manner as the magic-user spell disintegrate (including a saving throw versus death). Thirdly, the beam can be used to exert a powerful pushing force onto a target, causing it to move at a rate of 200' per round directly away from the caster. The first two uses of the spell have an instantaneous duration, while the third use lasts for one round per level of the caster. This spell, the pinnacle of the illusionist's art, enables the caster to bring forth into reality whatever he can imagine. It works in the same way as the magic-user spell wish, including the (optional) aging effect on the caster. The one difference is that an illusionist must first create an image of what he wishes to become reality, using other spells of illusion. He must then cast alter reality, which causes the created illusion to become absolutely and irrevocably real. This spell conjures a semi-real vision of a large vehicle of some kind, typically a mighty sailing ship, which the illusionist and up to 100 others may enter. The caster must be conscious in order to cast the spell, but all others to be taken aboard the vessel must be asleep. Unwilling passengers may make a save versus spells to avoid being taken into the dream vessel. In a manner similar to the 8th level spell illusory abode, the dream vessel may take on a recurring appearance if the caster wishes it, and the enhancements to spectral force and major creation apply inside the vessel. The passengers enter a shared dream of travelling a long distance aboard the conjured vessel through an imaginary landscape, with the caster in control as the helmsman or navigator. The journey usually appears to span several days, and may sometimes even feel like weeks of travel, though the exact amount of perceptual time elapsed is never clear, as is typical of dreams. While the dream vessel travels through an imaginary landscape, it is actually moving through real space at an incredible rate -- up to 100 miles per hour can be covered, completely unhindered by any real terrain. The spell lasts as long as the caster remains awake and conscious and the passengers remain asleep. This means that generally the duration is approximately 8 hours, but it may be extended by various means (for example if the passengers are in a prolonged, drugged or enchanted sleep). During the journey the DM should make random encounter checks as normal, and should feel free to come up with bizarre dream-like creatures and happenings along the way. Indeed, the casting of this spell could easily provide material for a whole game session. If any of the passengers is harmed while aboard the dream vessel, he or she will awaken immediately, ending the spell and unceremoniously dumping all passengers in the real world at a point somewhere along their planned course. Casting this spell is not without cost. It requires an oil distilled from a powerful astral, psionic or dream-related monster, which is consumed during casting. The oil must usually be obtained through adventuring, but may be available for purchase at exorbitant cost. It is possible to cast the spell without use of the oil, but there is a 1% chance per hour of travel (in real-time, not dream-time) that the vessel will become lost in the dream world and never return. This spell functions in a similar way to the 4th level phantasmal killer, except that it affects all creatures in range (with the exception of the caster, who may simply observe the effects). The phantasmal nemeses created attack as monsters of half the caster's level. In preparing for the con game I'll be running next weekend, I've been going back and forth on the issue of whether to make pre-generated characters, or whether to get the players to roll their own. Obviously the former would make the intro far quicker, but I feel like random character generation is such a feature of old-school games it'd seem a shame to not let them roll those 3d6s! So I want to come up with ways to minimize the lengthy parts of character creation, which are mainly buying equipment and choosing spells. The first thing I've made is a selection of spell lists for potential magic-user characters to choose from. (See image, click to make much bigger!) As the PCs are all gonna be 4th level, I've just prepared three choices of memorized spells (two 1st level spells & two 2nd level spells), meaning that up to three players could be magic-users and have their own unique spell list. No choosing or leafing through books required! Also note that I'm using a house rule that magic-users get to memorize extra spells if they have high INT, these spells are also included on the lists. A pretty neat solution, I think! My blogger stats, starting on the 8th of June, have increased roughly tenfold... I can't think of any reason why the popularity of this blog has suddenly sky-rocketed, so I'm assuming it's some kind of back-end problem at blogger. Just wondering if anyone else has experienced this? 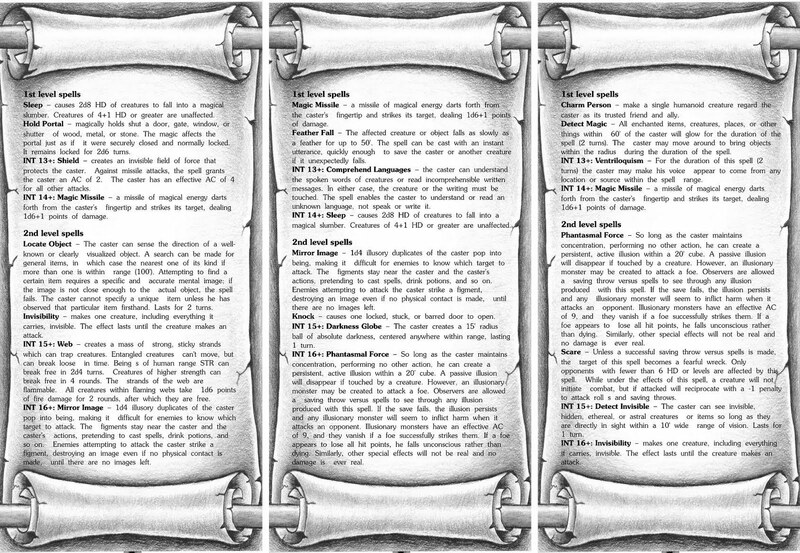 I just noticed this morning, as I went to look up a spell description in the Labyrinth Lord Advanced Edition Companion, how I love reading the LL books and that the feeling I get when reading them is close to the feeling I get looking through my old AD&D / basic D&D books. It's not quite the same, as there's obviously not the same nostalgia as actually handling the originals, and you obviously don't get to experience the Gygaxian genius that is distilled in AD&D, but it's close. And for me that's actually a really big deal. All other RPG books I've read, those for more modern systems, have a kind of "dry" feeling to them, somehow lacking in magic. So I'm glad to realise that the LL books, the ones I'm using in my game at the moment, have that "special something" as well. I know it's a totally personal thing, but it's important to me to have that special feeling about the games I'm running. I wonder if anyone else has a similar feeling? Note: Players in my game, you'd better not read these tables! After any session a character can choose to go carousing. They also roll a die (any type). If it comes up odd, then the DM rolls on the carousing results table, which indicates a noteworthy event which occurred during the character's boozing. Some of these are beneficial, some are detrimental, some are funny, and some may lead to adventures. I've mainly adopted this rule as a means to speed up character advancement a bit. As you can see I've modified it a bit from Jeff's original version, in that there's no randomness involved in the amount of money the PC spends. It just seemed simpler this way, and the carousing results table contains enough entries forcing the PC to spend more than they intended. The carousing results table is obviously heavily inspired by Jeff's original, but I've altered some entries, and expanded the whole thing up to a d30 table. The sacrifices table contains entries suggested by kelvingreen, anarchist and Daddy Grognard. Thanks guys! Hope someone else finds them useful / enjoyable!